A must-have guide for anesthesiologists new to the cardiac operating room DVD with 90+ narrated TEE clips Overall this book is a nice guide and the quickest way to review cardiac anesthesia. 3 Stars.--Doodys Review Service Cardiac Anesthesia and Transesophageal Echocardiography is a fast, efficient way for anesthesiology trainees to acquire the essential skills and knowledge necessary to successfully navigate the cardiac operating room. 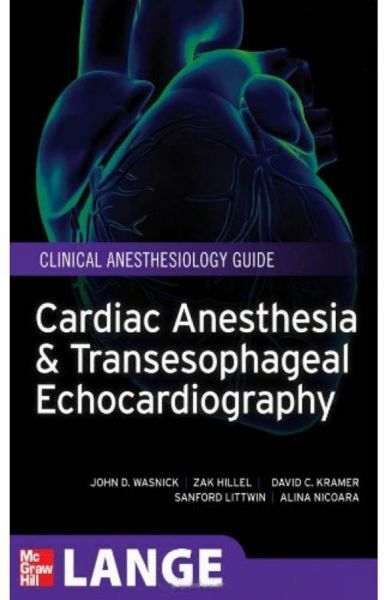 This unique guide imparts the basic principles of both cardiac anesthesia and echocardiography in a way that reflects the realities of clinical anesthesia practice. The companion DVD contains nearly 100 narrated, labeled TEE clips that illustrate normal and abnormal echocardiographic views. Each clip is keyed to a specific passage in the text, which provides the reader with a true multimedia learning experience. Whether you're looking for a concise, easy-to-read introduction to cardiac anesthesiology or a primer on incorporating the basic principles of cardiac anesthesiology and perioperative echocardiography into real-world practice, Cardiac Anesthesia and Transesophageal Echocardiography is your one-stop guide to mastery of these two critical topics.